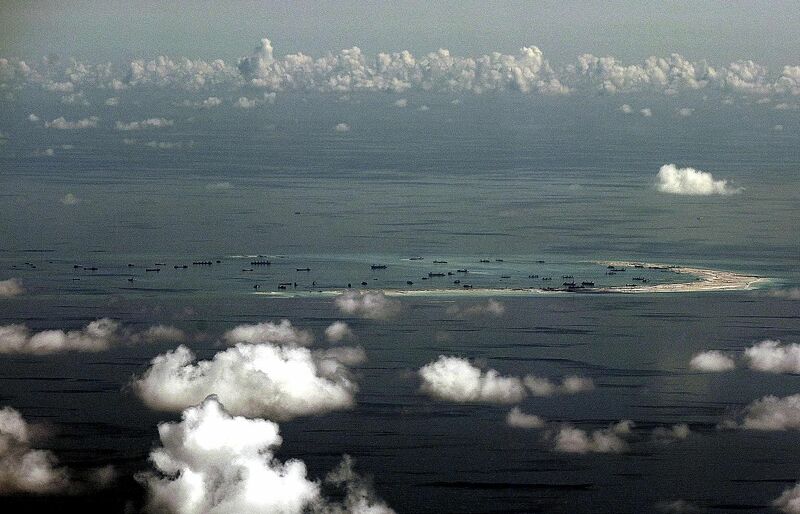 A 'Bill of Rights' for the South China Sea? Instead of a code of conduct that constrains behaviour, Asean and China should focus on "rights" that they can agree on - such as on sovereignty and freedom of navigation. Fifteen years ago, after intense negotiations, Asean and China failed to agree on a robust, legally binding code of conduct (COC). As a face-saving fallback, they agreed on a non-binding, ambiguous Declaration on the Conduct of Parties in the South China Sea (DOC). But the DOC has been spectacularly ineffective in reducing tensions, and mutually perceived "bad conduct". Indeed, most parties have violated one or more of its provisions, some repeatedly. The DOC provisions that have been frequently or continuously breached are the agreement to resolve their territorial and jurisdictional disputes "through friendly negotiations by sovereign states directly concerned", to "refrain from threat or use of force", and "to exercise self-restraint in the conduct of activities that would complicate and affect peace and stability". For the past 15 years, the parties have tried to come to agreement on a COC. But the best they have done, so far, is to agree on a loose "framework" for a COC. The prospects for a binding, robust COC in the near future are dim. The principal obstacle is that China does not want to have its options constrained nor its obligations spelt out in detail - a position that some Asean members agree with. The situation has become a stalemate between a steadfast China and a divided Asean. The potential for violent conflict persists, especially if outside powers continue to interfere. So, instead of focusing on what the parties cannot and should not do, perhaps they should focus on what they agree they can do - that is, focus on their inherent rights in the South China Sea. This more positive and uplifting approach would focus on negotiating agreement on an international "Bill of Rights" and benefits for parties making sovereignty and jurisdictional claims in the South China Sea. Once these parties agree, then the Bill could be opened for concurrence by others. The language would be basic and ambiguous, like that in the DOC and COC framework. But it would be positive and "can do". Some of these rights would be universal but particularly relevant to the South China Sea, and therefore, worth repeating, just like some of the wording in the DOC and COC framework. Agreement on such rights and positive language could build confidence - the confidence needed to address and agree on a COC that is primarily focused on restrictions and obligations. But it would serve as a guide to conduct, in the sense that, if the parties cannot agree on a particular right, a country asserting and exercising it would clearly be acting unilaterally, and not with the concurrence of other parties. This Bill of Rights would have equal moral weight with the restrictions and responsibilities of a COC, and might eventually be incorporated into it. What rights might the parties reaffirm? Perhaps, first and foremost, they should reaffirm that as United Nation members, the parties have the right to be treated as equals, and according to universally recognised principles of international law. In particular, the parties also enjoy the rights and benefits embodied in the UN Charter. As ratifiers of the the 1982 UN Convention on the Law of the Sea or Unclos, the parties also enjoy and exercise the rights and benefits therein. In the absence of agreement on a COC, the parties have the rights and benefits provided by the DOC. Other particulars to be agreed on might be the right to maintain their position regarding claims to baselines, sovereign rights or jurisdiction in their claimed territory, territorial sea, continental shelf, and exclusive economic zone (EEZ), the right to peacefully use the South China Sea, and the right of freedom of navigation and flight in the South China Sea. Also important to reaffirm would be the right to be free from the threat or use of force in their dealings with other parties, and the right to expect other parties to handle their differences in a constructive manner. More fundamentally, the parties might agree that they have the right to resolve their territorial and jurisdictional disputes and other differences through friendly negotiations between sovereign states directly concerned, without the involvement of or interference from non-parties. This was agreed in the DOC. Such agreement would not exclude the possible use of the Unclos dispute resolution process, where applicable, but it would reaffirm that the parties agree that they have the right to resolve their differences directly, if they so prefer. Some may consider this proposal a diversion. In a sense, it is a diversion - around an immovable obstacle on the path forward. The parties are at odds, and there are certainly things they should not do. But while limiting their options on the one hand, they should be able to exercise their rights on the other. The problem is agreeing on just what those "rights" and "wrongs" are. Let's be clear. China and Asean both face an international relations dilemma in trying to reach an agreement on a COC. China does not want to be seen as intransigent and a bully regarding Asean or other claimants. It wants to defuse tension and reduce the opportunity for outsiders like the United States, India and Japan to meddle or take political or military advantage of the disputes. But it does not want to surrender its core interests in the South China Sea. Meanwhile, Asean needs to demonstrate, to itself and to others, that it can be sufficiently united to successfully manage such difficult international issues in its region. This, in turn, is critical to its "centrality" and desire to be regarded as a major player in keeping outside countries at arm's length, and maintaining the peace and security of the region. Likely all of the relevant parties would prefer a continuation of the leaky status quo, rather than an increasingly tense and conflict prone security environment. But the status quo could easily wobble out of equilibrium. An agreed reaffirmation of their rights might just help stabilise the situation in the South China Sea. • The writer is Adjunct Senior Scholar, National Institute for South China Sea Studies in Haikou, China.